Chris Ryan, my co-host for "The NBA Life with Matt Bonner" extracted this audio gem from the Red Rocket on our last show. Bonner was in Philadelphia for Twilight Zone moment. Chris: What's a good story from the road lately? Bonner: We came in to Philly, and I dropped my bags off and went to do an interview with a band called “The War on Drugs.” I came back, got in the cab, told the driver we were staying at the Four Seasons. That’s where we’ve always stayed since I’ve been with the Spurs for the past five years. I got on the elevator and went to hit Floor 9 – I did remember what floor I was on – but there were only eight floors. I’m thinking, "That’s odd. There must be another elevator that goes to the higher floors.” I took a stroll around the lobby, and now I’m thinking, “What the heck?” I pulled out my hotel key: Ritz Carlton. I was at the wrong hotel. That’s my story. I know it sounds bad. Tough life. We’re at the Ritz Carlton, not the Four Seasons, but it’s still a funny story. The first time Jeremy Lin played against the University of New Hampshire, he scored five points in 26 minutes as Harvard beat the Wildcats, 83-81, in overtime. He was never spectacular in games against Dartmouth and UNH, and it wasn't a surprise he wasn't drafted. 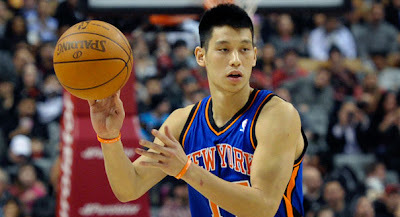 Today Lin has reached a Supernova of stardom with the Knicks, sparking a previously awful team to seven straight wins. Dartmouth coach Paul Cormier, who previously scouted for Golden State and recommended the Warriors draft Lin in the second round of 2010, said everyone can learn from "Linsanity." My full story is in today's New Hampshire Union Leader. Jeremy Lin inspires us all. 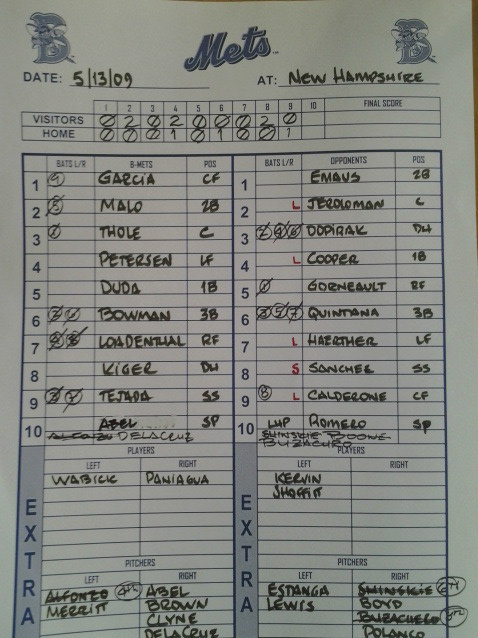 "Drew Hutchison scouting report" (78). 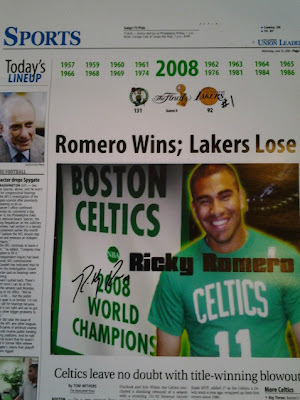 Here's a special sports front that was made for Ricky Romero after the Celtics defeated the Lakers in the 2008 NBA Finals. 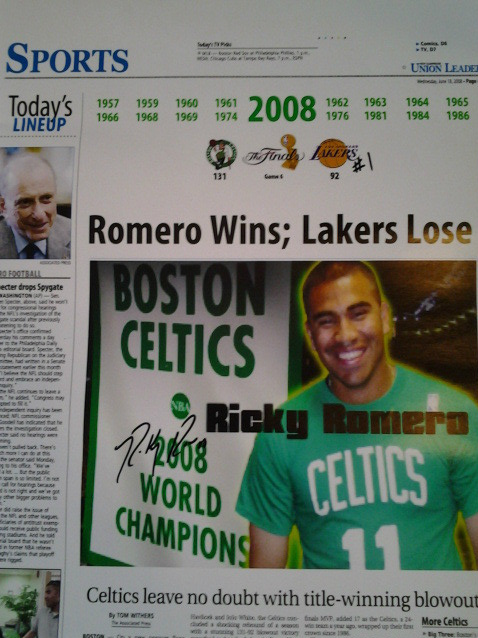 Though never published, it was part of an inside joke as teammates and the media began ganging up Ricky and love for the Lakers. He actually did wear that Celtics No. 11 shirt (Glen "Big Baby" Davis) during batting practice one day, the result of losing a bet. Media buzz: new closer Sergio Santos. 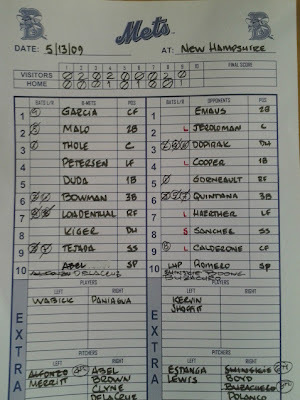 This time he's at big-league camp in Dunedin. All eyes on: Kyle Drabek. Could be the X Factor to Toronto's rotation. Rising star: Travis d'Arnaud is creating a nice catching problem for the Jays. Breaking out: OF Colby Rasmus and 3B Brett Lawrie. Friendly competition: Eric Thames and Travis Snider in left field. Protection needed: Jose Bautista's 2011 season was even more impressive when considering his lack of protection. Adam Lind needs a bounce-back season in the five-hole. Intriguing prospect: Moises Sierra. Earned a spot on the 40-man after a championship Double-A season. Sweet tools. 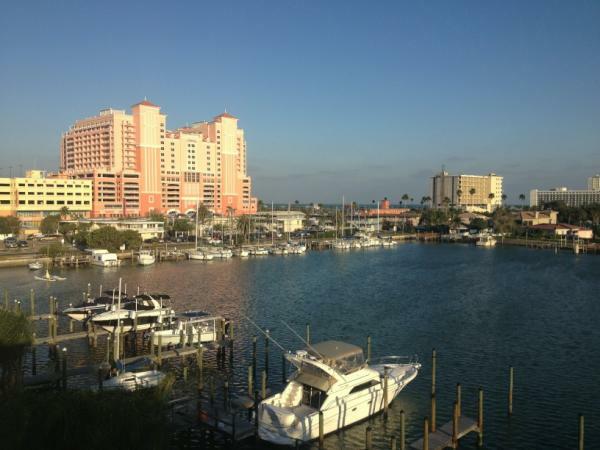 The view from J.P. Arencibia's crib at Clearwater Beach this spring. Photo by the mayor of the K2 Swag District.